It is time to celebrate an awesome travel hacking win! This morning, we received our first Chase Ultimate Rewards® bonus points for meeting the minimum spending requirements on my Chase Sapphire Preferred® card. This was the first card that either my wife or I opened with the intent of earning travel rewards. Prior to opening up this card (back in August), we had 2 main credit cards we used to earn cash back on most of our purchases (about 90% of our regular spending). In the past, the cash back rewards we earned (prior to August) were mostly at 1% of our spending and would get us several hundred dollars a year in gift cards. At the time, we thought this was a great way to hack our spending … and it was. But then we found out about travel rewards and were amazed at the potential to really optimize our spending. So on August 31, 2017 we opened our first credit card with the intent of building a travel rewards portfolio. How Did We Use Card #1? We used our first card to pay for most of our recurring expenses this past fall like – cell phones, water/sewer, gas bill, Netflix, Hulu, internet service, and a few more. Unfortunately, mortgage and car payments could not be paid for by credit cards. Nor can our electric bill for the home for some reason? In addition, we paid for almost all of our gas (for our cars) during the 90 day window on this card as well as 50% of our groceries. There were also a few one-time expenses like car insurance and maintenance. Overall, we spent $4,398 on this card in just under 90 days. That qualified us for earning the 50,000 bonus points for signing up for the card … after meeting the $4,000 minimum spending requirements in the first 90 days. We hit our $4,000 minimum spending target on around day 80 of opening our first card. While we cut it a little close with around 10 days (+/-) to spare … we never thought we were in jeopardy of not hitting this target. Our spending actually went over by almost $400 from our target just to give us a little buffer as we certainly didn’t want to lose out on the bonus. After-all, that is the reason for opening the card in the first place. I even placed a call to Chase to confirm we hit our minimum spend after passing that $4,000 target. Their customer service was fantastic by the way and verified that … yes we hit our spending limit. 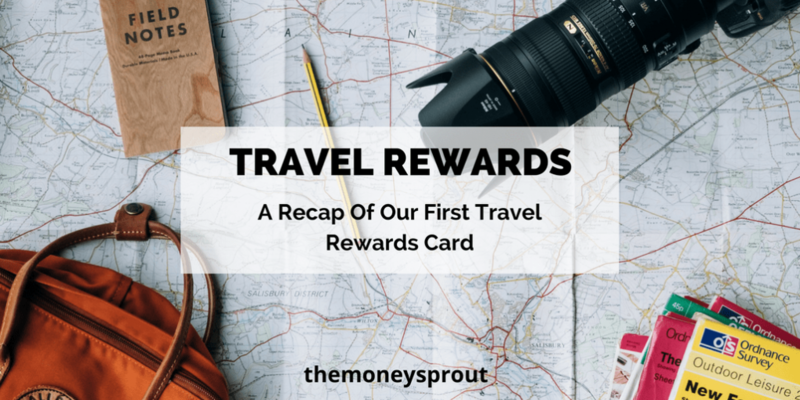 Anyways … here is a recap of the points we have earned to date on card #1 on our travel rewards journey. Happy Dance … fist bump! As you can tell I am pretty excited about getting these points. At a minimum, these points are worth $644.17 ($0.01 per point) in cashback from Chase. But using them for travel means they could be worth double that ($1,290+) or even more! We plan to track when these points are used and will share updates in future posts. A few quick notes on the breakdown of points we earned. As you can see, we spent $4,398 in total on our card which gave us the equivalent in points. Of that spending, $19+ was done at restaurants which gave us another point for that spending. We made a couple McDonald’s stops for the kids. Of course we got the 50,000 point bonus for hitting our minimum spending requirements. But the icing on the cake was the extra 10,000 referral points we earned that I didn’t original expect. After opening up my account, I realized you could refer a friend and bank an extra 10,000 points. So I referred my wife who is currently building points on her card and I got the referral bonus. Awesome! So … overall I am really pumped about the potential for travel rewards. For now, I am keeping my first card open, but will stop any spending on the card. I want to figure out the best place to hold our Ultimate Rewards® points as my wife and I work at finishing up cards #2 and #3. The annual fee of $95 will kick in at the end of August 2018, so I do have some time to figure out the best strategy. In the meantime, we are working at finishing our spend on our current cards – Chase Sapphire Preferred® for my wife and Chase Ink Business PreferredSM for me. My wife is only $300 away from hitting her spending limits with about 50 days to go. This will not be a problem finishing this card which should earn us another 54,000 points. The question then becomes how to consolidate her points with mine. As far as my Chase Ink Business PreferredSM Card card, I will be paying for our property taxes later this week, which will send us over the minimum spending limit ($5,000 on this card) with about 50 days to go. This should earn us another 85,000 points! So as we are wrapping up our first 3 cards … the focus has shifted to what direction to go now? We have been strongly considering opening up one card just to pay for my middle son’s braces next month. We may try and use a quick hack to pay his braces up front on a new card, and then give ourselves a loan from our emergency fund to pay off the card. Then over the next 3 years would pay ourselves back … instead of paying it to the orthodontist. Plus, paying the balance off for his braces would give us a 5% discount on the braces … so the math tells us to do it. As far as which card … I think we would go for the Chase Ink Business PreferredSM Card for my wife if she can get approved. Then if all that works out as designed, I will look at opening up card #5 sometime early next year under my name. We will likely move away from Chase for a while but need to figure out what direction to go. Oh yeah … we are working to earn all these points so that we can take a FREE trip to Hawaii in a couple of years with our family of 5!